The sleek craft reportedly reached an altitude of 114,500 feet and a speed of Mach 1.9. Space tourism took another step closer to reality on Tuesday as Virgin Galactic's VSS Unity spaceplane fired up its rocket motor and completed its second supersonic flight over the Mojave Desert in California. The rocket fired for 31 seconds, propelling the sleek craft and its two pilots to a speed of Mach 1.9 (almost twice the speed of sound, or about 1,500 miles per hour) and a maximum altitude of 114,500 feet, Virgin Galactic said in a blog post. "Seeing Unity soar upwards at supersonic speeds is inspiring and absolutely breathtaking," Virgin Galactic's founder, Richard Branson, said in the post. "We are getting ever closer to realizing our goals." Branson was on hand to witness the flight, which took place about two months after Unity completed its first rocket-powered flight on April 5. That flight came about four years after the Oct. 31, 2014, crash of another Virgin Galactic spaceplane, which killed test pilot Michael Alsbury. In Tuesday's test, Unity and its pilots, Mark Stucky and Dave Mackay, were carried aloft beneath the wings of the company's jet-powered "mothership," Eve, before being released to fly on their own. The spaceplane climbed steeply before descending and landing safely at the Mojave Air and Space Port in Mojave, Calif.
Tuesday's flight was conducted to test Unity's handling characteristics and the performance of its control systems, according to the blog post. Virgin Galactic is one of a small handful of companies that intend to give paying customers a chance to make brief flights into space. Among the other companies are Elon Musk's SpaceX and Jeff Bezos's Blue Origin company, which has completed several tests of its New Shepard rocket and capsule system. Blue Origin says it could begin taking customers into space later this year, CNBC reported. 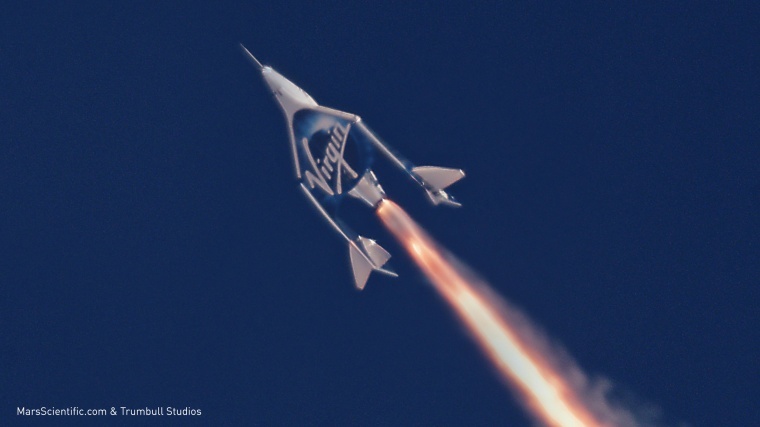 Virgin Galactic has been mum about exactly when it might begin taking customers into space. But earlier this month, Branson told the BBC that "we're talking about months away, not years away." And Branson could be one of Virgin Galactic's earliest passengers. "I'm going for astronaut training," he told the BBC. "I'm going for fitness training, centrifuge and other training, so that my body will hopefully cope well when I go to space." Additional reporting by Denise Chow. Want more about space tourism?